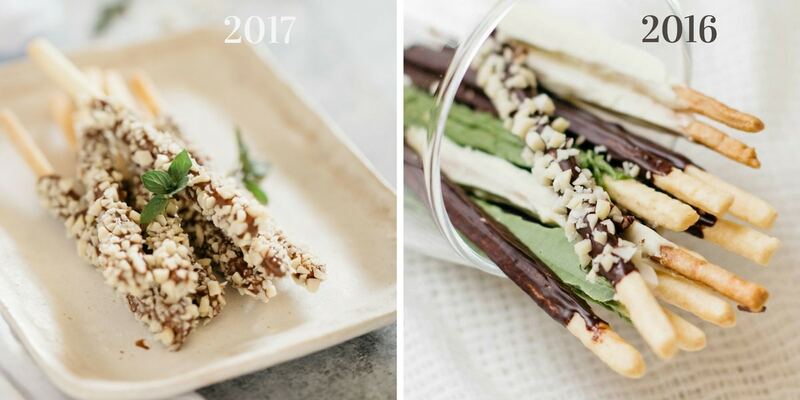 To celebrate Japan’s Pocky Day on the 11 of November, I am updating the homemade Pocky recipe so you can make your very own Pocky at home. If you’re not sure what Pocky is, let me share with you this classic Japanese treat. Pocky is a very famous snack, that’s a bit like a long thin pretzel (or a tiny bread stick) that’s coated in chocolate. You can find Pocky basically anywhere in Japan, and even in most other countries in the world. 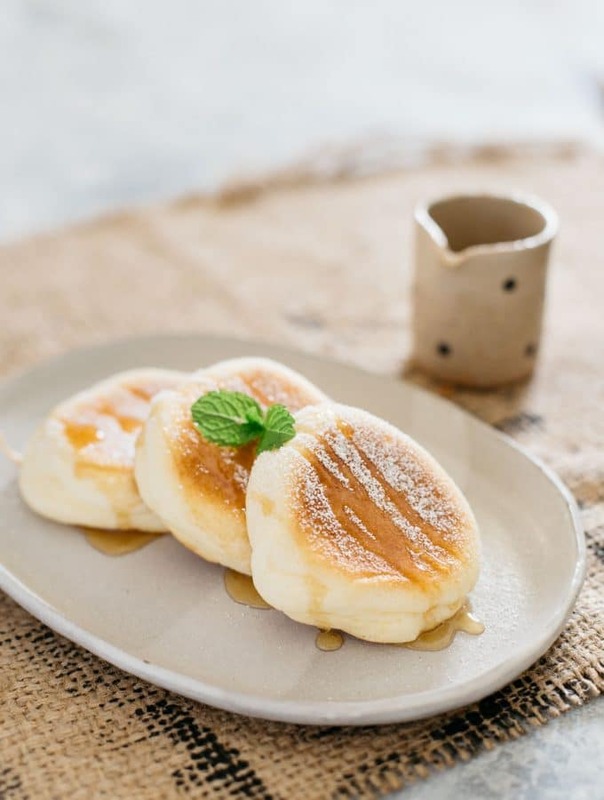 However, in Australia they are a lot more expensive than they are in Japan, so to save money and have fun, you can make them yourself by following this easy recipe! 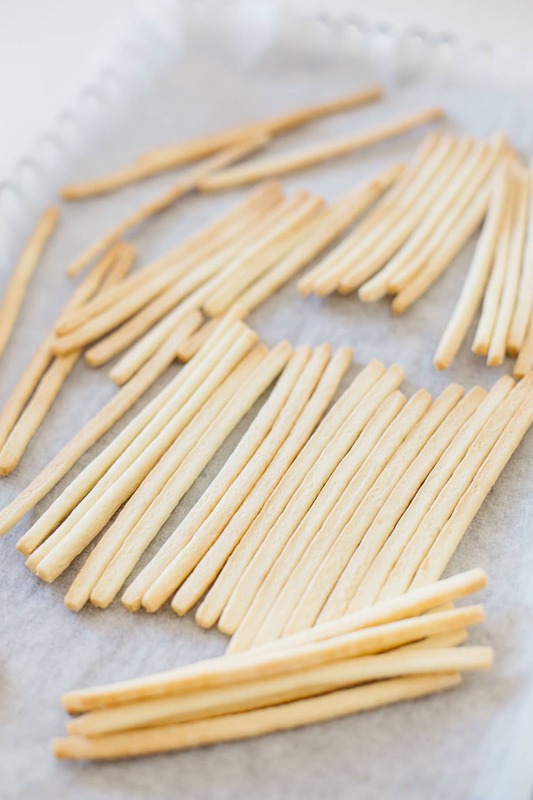 Because Pocky is so readily available, I never thought about making it myself. A student gave me inspiration for this recipe when she attempted to make Pocky for an assignment for a food themed unit in my Japanese class, and I started thinking, “Oh, Pocky can be homemade?” Since this cheap snack in Japan is actually a luxury item in Australia (at twice or three times the price), it is actually a great idea to make it yourself! At first, I thought Pocky would be hard to make at home but it was actually really easy. 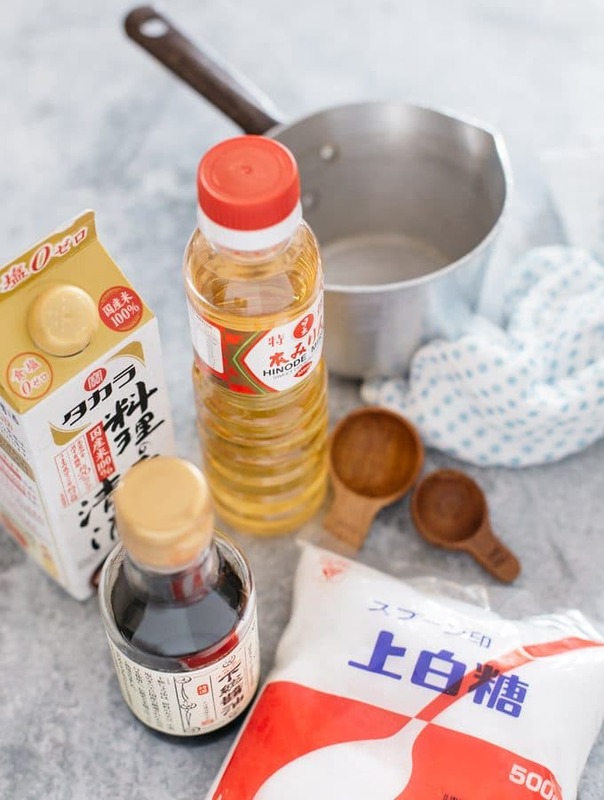 You don’t need any special Japanese ingredients, so you don’t have to go online or to Japanese grocery stores to find what you need! All the ingredients are easily available from any regular supermarket. And because I was making these myself, I was also able to choose whatever flavours I liked! So you can either spend AUD $3 for a tiny packet (or even more if you want different/special flavours), or if you decide to try homemade Pocky you can end up with about 70 plain Pocky sticks to enjoy for the same price! You can also choose to have a variety of different flavours to enjoy. In my previous Pocky post, I made a selection of flavours including white chocolate, and matcha. This time, I decided to make milk chocolate and crushed almond varieties. 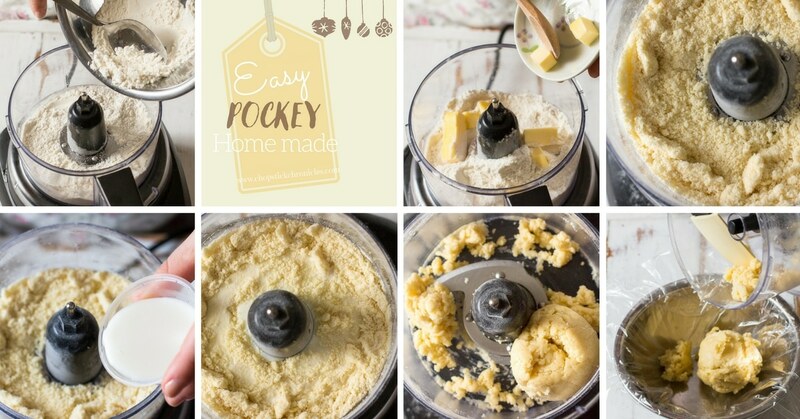 However any flavour you try is sure to be equally delicious and easy! Even though Halloween has just finished, for next year make sure you check out Halloween versions of Pocky too. 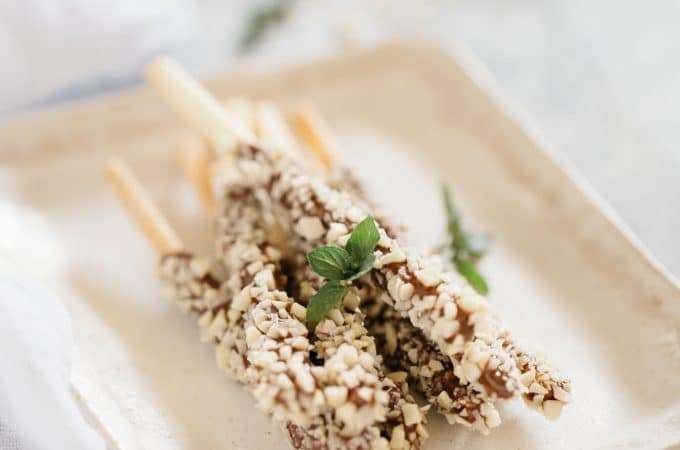 If you liked my recipe for homemade Pocky, please rate it and leave a comment below. 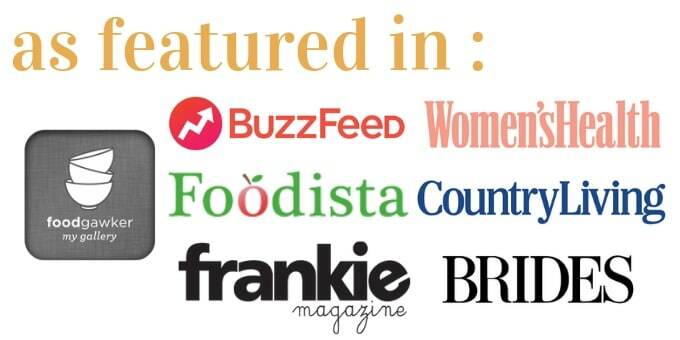 Also, don’t forget to follow me on Youtube, Pinterest, Facebook and Instagram to keep up to date with all the latest happenings on Chopstick Chronicles. Don’t forget to use the hashtag #ChopstickChronicles so I see your wonderful creations! Add all the dry ingredients into a food processor and pulse one or two times. Add the chopped butter into the food processor and pulse two or three times until resembles coarse bread crumbs. Add the milk and pulse again. Wrap the ball of dough with saran wrap/cling film and leave it in the fridge for 30 minutes. Preheat the oven to 180 degrees Celsius (or 350 degrees Fahrenheit). Roll the dough out until it's about 5mm thick. 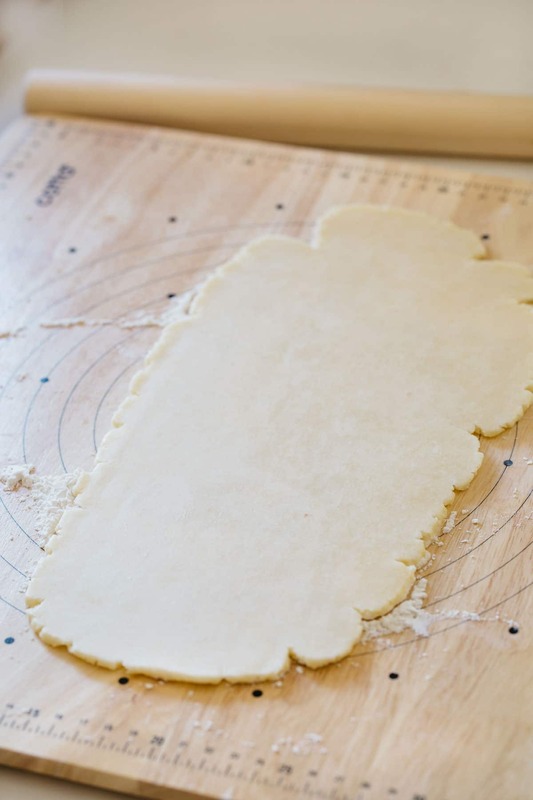 Form it into a rectangle shape, cutting off the excess dough on the sides. Then cut it into thin pieces about 5mm (or 0.19 inches) wide. Place the sticks in the oven and bake for 15 minutes. Coat with melted chocolate, and any other toppings of your choice. If you don’t want to make 70 sticks in one go, the cookie dough can be stored for about 3 days in the fridge, and for about 3 months in freezer. 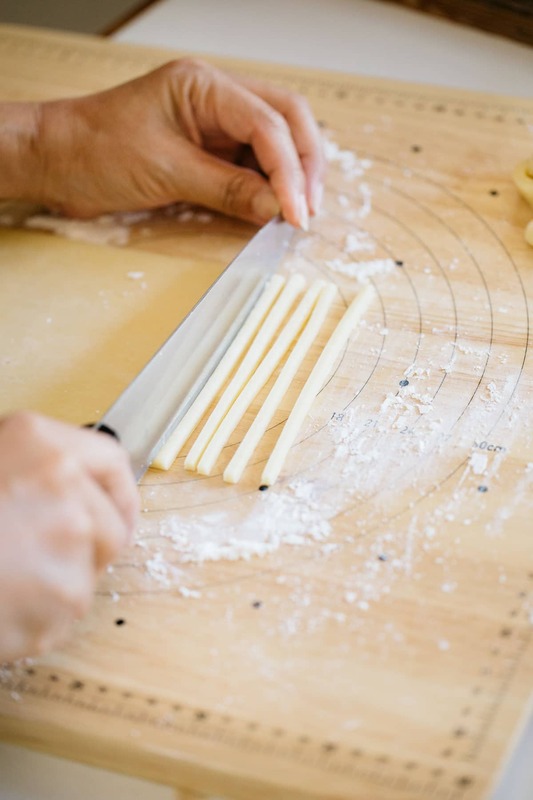 Ensure the dough it tightly wrapped in cling film (twice) and stored in a zip lock bag. 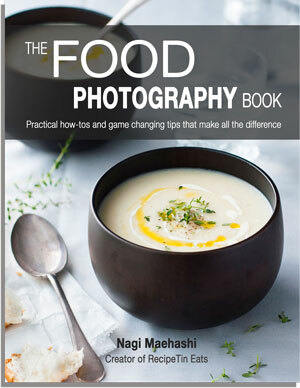 This is really a cool recipe, I am going to try it! Thank you! Hope you have fun making it! These look great! I should make these with my daughter. She is very interested in trying Pocky after seeing one of her school friends have them with lunch. OMG! I love Pocky! This is great – and so many flavors! Thanks for sharing! I love Pocky too! It’s one of my favourite snacks. Thank you! Thank you! Me too, Pocky is so good! I LOVE this post! 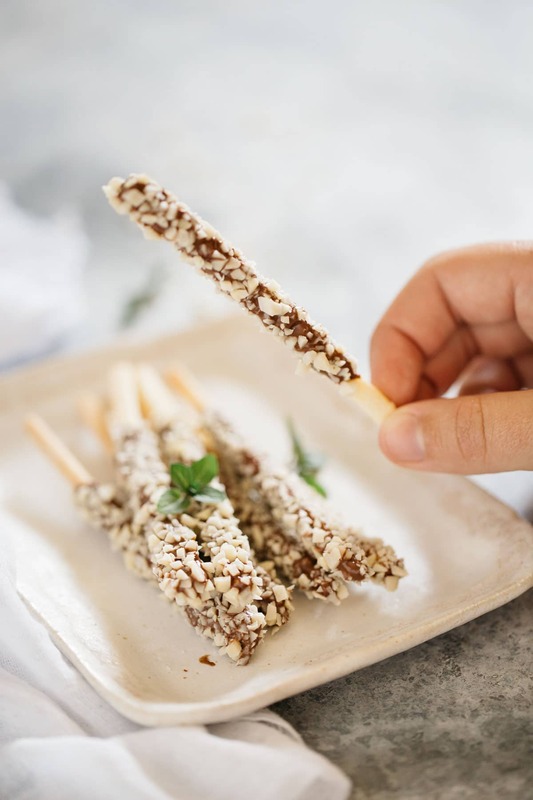 Pocky are such a fun snack, and I never thought of making them at home. Definitely saving this recipe. I bet they taste fantastic! So cute! It’s like a shortbread cookie covered in chocolate, you can’t go wrong with that! Thank you Teresa. Homemade one is crispier than store bought Pocky too. My boys just LOVE pocky sticks. I had NO idea they are so easy to make, and with so few ingredients. 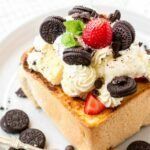 I can’t wait get into the kitchen and make these with them! What a great recipe! My little boys LOVE pocky sticks. But rarely do I buy it for them. 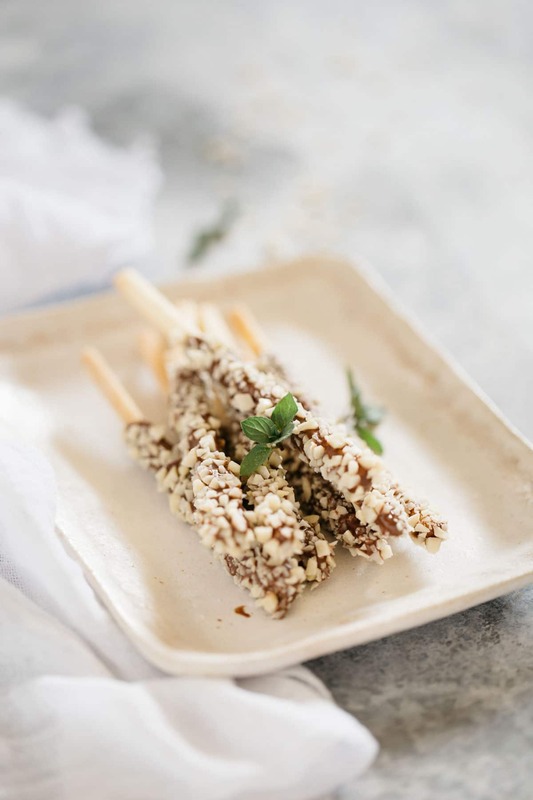 I had NO idea how simple they were to make… And with so few ingredients. I can’t wait to make these with them. They are going to be SO EXCITED! Hi Toni, There are two Japanese grocery stores in Brisbane that I usually go. They stock pocky but you can not beat home made one. They are crispier and cheaper! 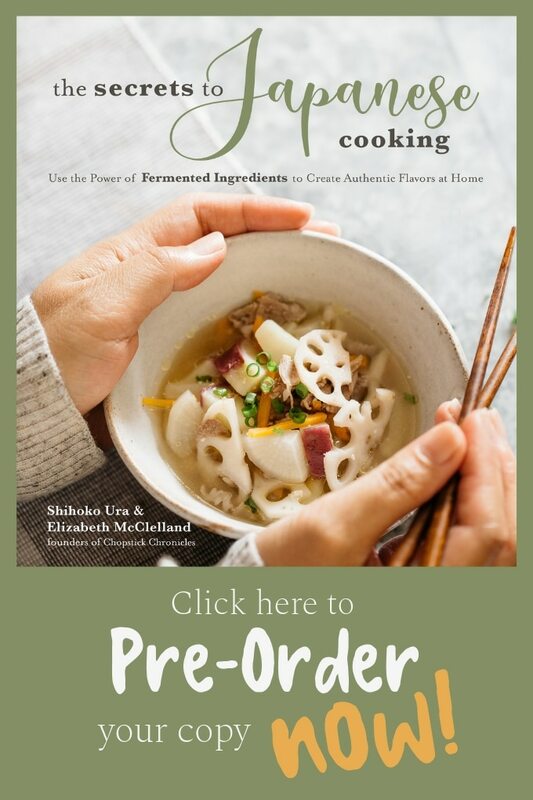 I am definitely going to try making it but I would be interested in knowing about the second Japanese grocer. 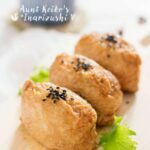 I use several general Asian grocery stores in Mt Gravatt and Sunnybank and occassionally go over to the north side to Genki Mart for a better variety and stock up on things like aonori that can be hard to find in other shops. PS I just found your site this week and love it! Hi Toni, Thank you for visiting my blog and glad to know you like it. Ok, the two Japanese groceries shop I usually go is Genki mart which you mentioned and another one is Fuji mart. Fuji mart is in Shop 5, Buranda Village, 264 Ipswich Rd., Woolloongabba. This one is slightly bigger than Genki Mart and have more stuff. They open till 5:30pm every day I think. Thanks for that, I’m going to take a look this week! This is SO COOL!!! 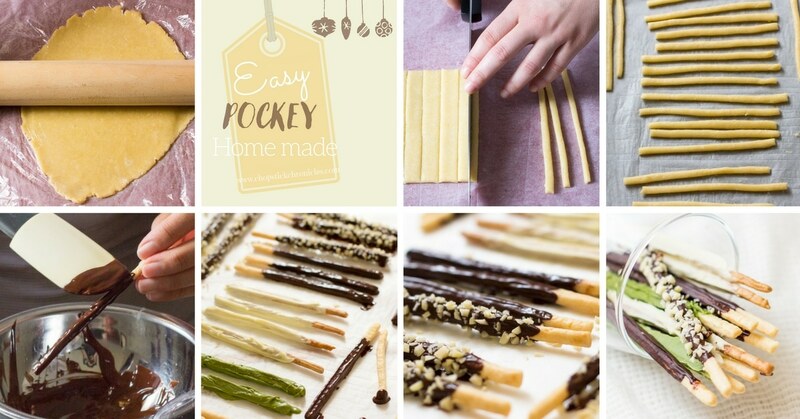 I never thought about making pocky sticks at home! Pinning! So, not that I have tried it yet but,… what is keeping people from trying to make fruit flavored pocky? I would think you could accomplish it with a little fruit flavored powdered drink mix. I would suppose you could do that with a flavored oil but if you wanted any little bit of tanginess to shine, oil wouldn’t do the trick. Flavored oils and sour salts (Jewish food item)??? Would those work? I know you can BUY it. I love milk pocky, Brazilian pudding, and Brazilian orange. I can’t find pineapple yet. And I think I missed my chance to try pumpkin (there is a Japanese American supermarket chain store kind of near me and I think they carry it seasonally). I can always find the strawberry and regular milk chocolate with ease. Strawberry just doesn’t suit my fancy. 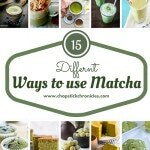 I can find matcha, almond crush, coconut flake, and banana/chocobanana almost as easily, too. But, again, I’m not mad about those. Men’s pocky (dark chocolate) is pretty good but I can make that easy… I suppose I could use some instant pudding mix with white chocolate to make pudding flavor pocky. I would love that if I could pull it off. Now if only I could make those yummy filled marshmallows. They aren’t overly sugary and I love the consistency of the chocolate or pudding-flavored filling. I did today.but the chocolate is not set on the stick.Do I need to add any oil inside the melted chocolate? Hi Tan, you don’t need to add anything to the chocolate. Did you coat the pocky when it is cooled down completely and cold? Also can I use salted butter & avoid the separate addition to salt ? Hi Nina, Thank you for visiting. The temperature is 180 degree celcius(356 degree Fahrenheit) Salted butter will have more salt than using unsalted butter and add salt separately. 1 more question..for sugar..is it powdered or granular ? Temp I used..150-160°c for 20 mins..got a lovely light pink roast & crisp !!! Shall now dip in chocolate. Any other dipping suggestions please ??? Awesome recipe. 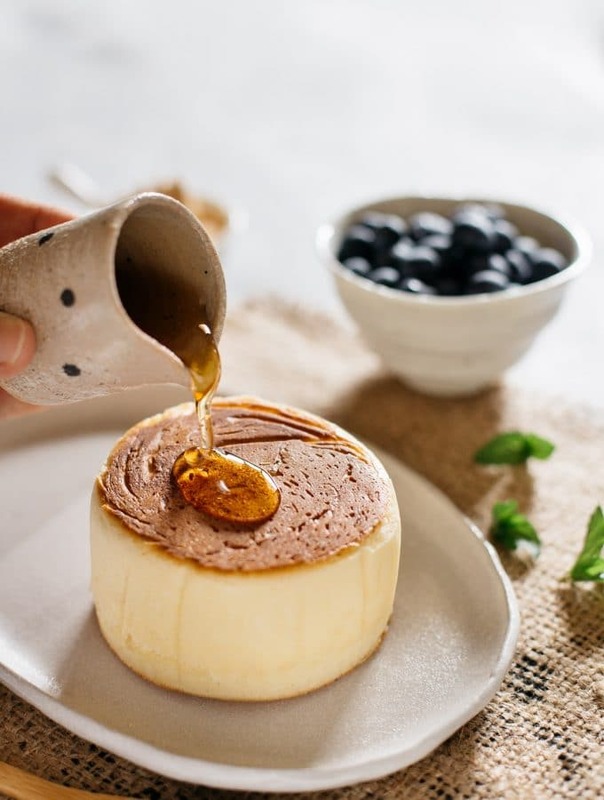 This looks so tempting and delicious that I can’t wait to make it. 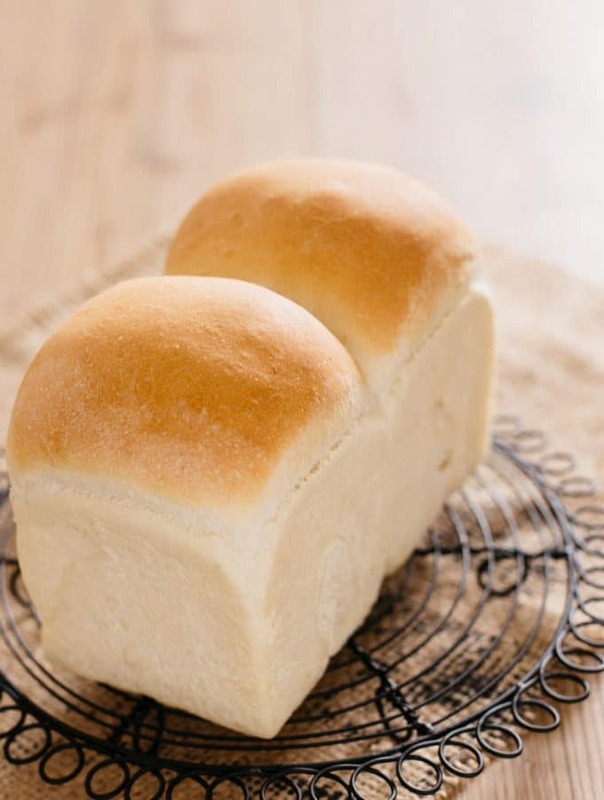 Thanks for the detailed recipe so that it can be prepared without any mistake. Keep sharing such yummy recipes. I baked repeatedly already. Very much it’s good. My godchildren love it. Thank you for the recipe.